Suits, freaks and beatniks have had a home at the Fourth Avenue Street Fair for 41 years, bringing thousands of people together along the Avenue twice a year. 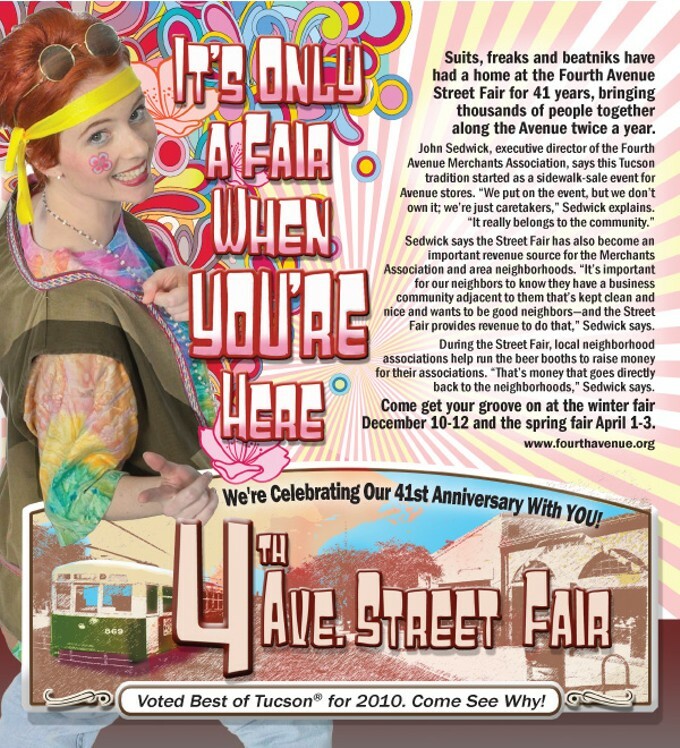 John Sedwick, executive director of the Fourth Avenue Merchants Association, says this Tucson tradition started as a sidewalk-sale event for Avenue stores. "We put on the event, but we don't own it; we're just caretakers," Sedwick explains. "It really belongs to the community." Sedwick says the Street Fair has also become an important revenue source for the Merchants Association and area neighborhoods. "It's important for our neighbors to know they have a business community adjacent to them that's kept clean and nice and wants to be good neighbors—and the Street Fair provides revenue to do that," Sedwick says. During the Street Fair, local neighborhood associations help run the beer booths to raise money for their associations. "That's money that goes directly back to the neighborhoods," Sedwick says. We're Celebrating Our 41st Anniversary With YOU! Voted Best of Tucson® for 2010. Come See Why!